Hillery York is the Collections Manager for the National Numismatic Collection. The objects discussed below are featured in the Women on Money display in the Stories on Money exhibition. Stay tuned for more blog posts from the National Numismatic Collection team in celebration of National Coin Week, April 16–22, 2017. While inventorying a selection of ancient coins in the National Numismatic Collection, I couldn't help but notice all of the beautiful depictions of women on coinage from around the world. With recent discussion about which woman should adorn the newly designed $20 bill, it is valuable to note some of the first female figures on currency can be found in the ancient world. Prior to the portraits of emperors and rulers, the first being Gaius Julius Caesar (46–44 BCE), many ancient coins were struck with images of religious figures, a favorite being goddesses. Goddesses were often rendered as traditional portraits, however full-body portraits also exist on currency from around the world. Many examples of ancient coins with goddess imagery come to us from the Lydian coin tradition, in the Mediterranean. These intricate images utilize complex imagery to communicate which goddess is being depicted along with symbols that are often associated with the imaged deity. Goddess imagery was used to symbolize religious strength and the patronage of a particular goddess to a city or region. Interestingly, goddess imagery has reemerged on currencies from around the world in the modern era, often rendered as statues or other forms of art. One of the most popular goddesses depicted on early monetary objects is the goddess Athena, whose portraits adorn many coins from Ancient Greece. Athena is the Greek goddess of wisdom and warfare. Her fantastic birth describes her springing fully grown and clothed in armor from her father Zeus's head. On currency, she is often shown wearing a full helmet or headdress, as if she is preparing for war, and is often accompanied by the image of an owl. Athena lent her patronage to the ancient cities of Athens. This gold Stater from the Kushan Empire depicts the Persian goddess Ardochsho. Ardochsho is the goddess of fortune, wealth, and prosperity. This particular goddess is often shown sitting on a throne holding a cornucopia in her left hand. It is speculated that worship of this Persian goddess traveled to the northwestern region of the Kushan Empire through contacts with Central Asia during the 2nd–1st century BC. 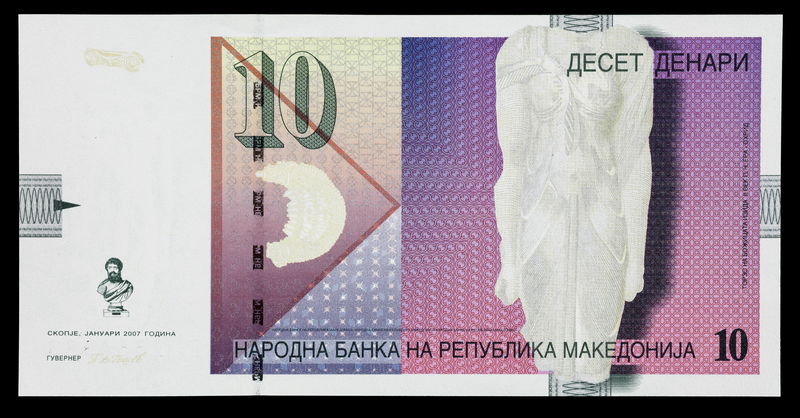 A goddess that adorns modern Macedonian currency is the Egyptian goddess Isis. Isis is the goddess of health, wisdom, and marriage. During ancient times, the Egyptians believed the Nile river flooded because of the tears she wept over the loss of her husband, Osiris. While Isis was originally worshiped in Ancient Egypt, she was later worshiped throughout the Greco-Roman world. The name Isis means "throne" and refers to her elaborate headdresses. On this particular note, only the goddess's torso is depicted, taken from an alabaster statue of Isis from the 3rd century BCE, found in Ohrid, in the Republic of Macedonia. These intricate and beautiful images of goddesses on ancient and modern notes and coins show that the prevalence of these myths and legends have persisted to the present day. They are reminders that as we focus on the future of United States currency, we shouldn't forget these powerful, mythological figures in countries around the globe. Hillery York is the Collections Manager for the National Numismatic Collection.